When I shop for cosmetics, I check the ingredients and the effect the product would have on my skin. So, I don’t usually choose a product simply by the way it looks. Lush Cosmetics changed my perspective a little bit! With the Pearl* massage bar by Lush Cosmetics, however, I couldn’t stop myself! I fell in love with the pink and white design and I just wanted to have it. The bar is made of rose oils, so it has this natural rose aroma. Pearl nourishes my skin and leaves it soft and smooth. It also contains natural cocoa butter, Shea butter, Argan Oil, Lemon and Coconut oils. I tend to use few products on my feet. Exfoliating them is a real treat for me, and when I have the time, I enjoy it to the maximum! The cute little scrub bar Stepping Stone* is the best solution for dry and dry skin removal. What I do is break off a piece and rub it against my wet feet. The scrub is gentle but at the same time quite effective. It freshens up your feet and you definitely notice the result. The Seanik* shampoo is really easy to use. You can either rub in between your wet hands or directly on your scalp. It makes a soft foam and washes off well. My hair is quite thin and often lacks volume, I also tend to wash it often, so when I shop for shampoo I go for the one that gives volume. Seanik contains sea salt that gives me exactly this volume while the seaweed in it, hence its name, make it soft and silky. Here’s one of my all time favourite Lush products! I don’t have a problematic skin anymore, so pimples and all kinds of blemishes are not something I worry about. However, my skin tends to get a bit greasy during the day. What the Magnaminty* mask does is help me regulate the excessive sebum. It’s very fresh and minty, acts as an exfoliant and revitalises my face. And its smell of sweetness and mint is simply amazing! The Rose Jam* shower gel has a strong rich smell of roses. I’m generally not such a big fan of roses and rose scents, especially if they are strong, but I decided to give this product a chance. It proved to be quite pleasant after all. Its lather is soft and creamy and cleanses my skin very gently. The smell of Turkish roses stays on for hours, and the Argan oil repairs my skin and act like an antioxidant. I’m crazy about jasmine, so when I found out the Love You Mom soap smelled like it, I knew I’d love it! The gorgeous smell is combined with the scent of mimosa. The Bergamot Oil in it makes my skin nourished and soft. So, have you ever bought something simply by the way it looks? All the products look amazing, I particularly like the sound of "Rose Jam", I really should try it! 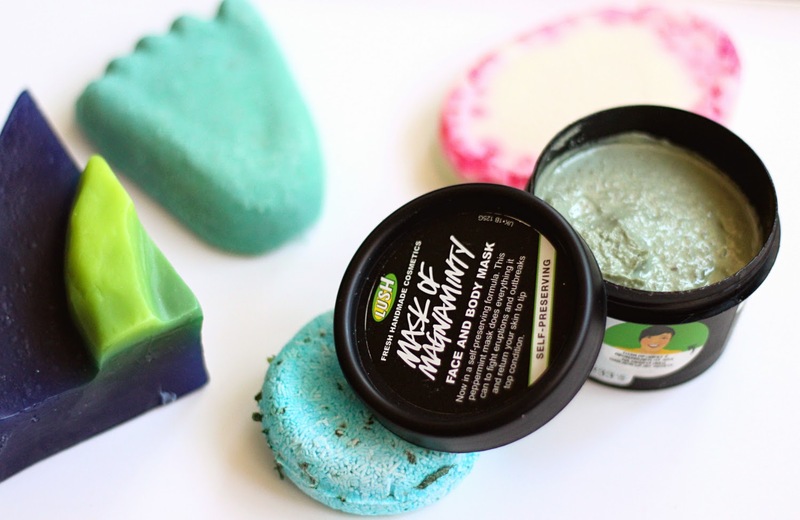 I love Lush <3 those products are amazing ! I love lush! This should have an amazing scent! sounds good product, i should try it! !